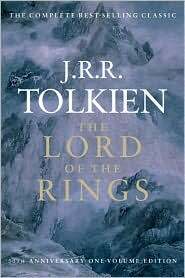 Two summers ago I started reading Tolkien’s The Lord of the Rings, and a few days ago, on a plane ride from Tulsa to Las Vegas, I finished it, right as the plane was setting down on the ground. Wow. What a book! Tolkien didn’t merely write a story – he created a world, complete with its own languages, histories, genealogies, myths, and even metaphysics. Its a book that doesn’t fit on a spectrum, but it creates new spectrums of its own. It doesn’t fall into the orbit of some already existent genre or category, but it creates its own orbit. Its depth, beauty, and richness are difficult to describe. I definitely will be re-reading it throughout my life, and don’t expect to ever hit bottom. One of the things I did while reading was note some of the most prominent differences with the movies, which I will list in this post. Because I think that Peter Jackson did about as good a job as could have been done in faithfully taking this story to the screen, I think exploring what he did change is interesting, and illuminates some of the more general challenges in making books into movies. 1) The greatest differences are structural: the movies grind off parts of the beginning and the end of the story, presumably for greater flow. Towards the beginning, Tom Bombadi, the Old Forest, and the Barrow-Downs are cut; at the end, the scouring of the Shire is eliminated and the death of Saruman is relocated to right after the battle of Isengard. You also have much of the traveling (on which Tolkien spends much time throughout) reduced in the movies. The result is that the book, like a huge boulder, takes longer to get moving, and longer to slow down. I think the changes here were understandable in light of the time constraints a film must have, and the practical impossibility of portraying a character like Tom Bombadil on screen – but nevertheless I liked the book so much more. It feels more authentic, less Hollywoodized and marketed. 2) The book is fuller, richer – it has more detail, more history, more songs, more life and energy. At times I found the amount of detail difficult to absorb, and it took discipline to keep going. But at the end of the day, again, you have a story that feels so more authentic than a 21st century action movie, filled with soundbites and rapid plot changes and action scenes. I think I can understand why Tolkien fans would be purists or snobs. 4) The general number of character is reduced. From the movies you learn little or nothing of Fatty Bolger, Farmer Maggot, and a host of other hobbits; Glorfindel and Gildor the elves; Ugluck, Shagrat, Gorbag, and Lubgurz the orcs; Gwaihir the eagle; Widfara, Elfhelm, and Grimbold, leaders in the Rohirrim; Beregond of Gondor; Halbarad and the other Dunedain; Bregalad the Ent; Ghan-buri-Ghan the wild man; and many others. The roles these characters play are either given to others in the movies (so Gandalf saves Faramir rather than Beregond, Elrond brings Aragorn the reforged sword instead of Halbarad, etc.) or eliminated altogether (so Ghan-buri-Ghan never helps the Rohirrim find an un-watched path to Minas Tirith, etc.). Of all the character omissions, I think that of Imrahil, Prince of Gondor, is the most noticeable. He is a significant character in The Return of the King. Maybe Peter Jackson thought it was too difficult to introduce a major character that late in the series? 5) The romance of Aragorn-Arwen is increased in the movies, and the romance of Faramir-Eowyn is decreased. 6) Sam is much younger than Frodo in the book. He both uses the Ring and looks into the mirror of Galadriel. He never leaves Frodo, but goes into Shelob’s lair with him. Even more so than in the movies, I think Sam is an unsung hero. 7) There is more “back and forth” in the movies. In The Two Towers, for example, you have nothing of Sam and Frodo until the second half of the book. It stays with certain characters for long stretches of time. 8) There are lots of minor plot changes – the details of Frodo getting stabbed on Weathertop, the flood at the Ford soon after, the attack of wolves in The Fellowship of the Ring, Faramir never hindering Frodo and Sam, etc. Many events and lines are kept, but chronologically displaced. 9) The battle at the end of The Two Towers is hugely enhanced. In the movies its a massive part of the story. In the book, the battle at the end of The Return of the King seems much more significant. 10) Pippin and Merry seem more mature and less comedic. Merry rides to battle and meets no resistance from Eomer about it, only a little from Theoden; Pippin is not scorned by Gandalf for offering his service to Denethor. Both characters play important roles in battle. By contrast, Legolas and Gimli seem a bit less important – they seem to get overshadowed by other characters, especially Aragorn. Lets hope The Hobbit movie does as good a job at capturing the book as The Lord of the Rings movies did.